At the 10th World Wilderness Congress we discovered hundreds of young activists who were working quietly behind the scenes to make the WILD vision a reality. We felt that these people’s activities should be recognized. In keeping with the knowledge that young people are the future, we asked our team of young trainee journalists in the press office to go out and interview them. Original post from the WILD10 conference blog. See the original here. Thanks to the World Bank, which acts as global sponsor, there are more than twelve countries involved in the conservation of tigers nowadays. However, when Li Quan started to work for this beautiful animal, she was almost on her own. It was thirteen years ago when she started the Save China’s Tiger project. As she explains: “All tiger are in danger, but the South China tiger is particularly threatened, it is critically in danger.” By 2001 some organisations even considered this animal an extinct species, but Li Quan thought: “I’m not going to accept this”. She wanted to help China and she decided to do something about it. This young woman is proud to be one of the first people to use the word that is much bandied about at WILD10: rewilding. Nowadays this is a commonly accepted term when talking about conservation with many scientists working for it, but back when Li Quan started her project, nobody believed this could be possible. She had big plans for South China tigers and decided to take these animals from Chinese zoos to South Africa, where there was the infrastructure for ex situ breeding. New offspring are raised there and, when they are mature enough, they are brought back to China; not back to zoos but to the wilderness. A second generation of South China tiger has already been released and so far more than eleven tigers have started to procreate in the wild. “Thirteen years ago the tiger population was going down and down, now it has been proved that there was a point in what I did”, says Li Quan. “Thanks to this, we are recovering tigers, we are rewilding China”. 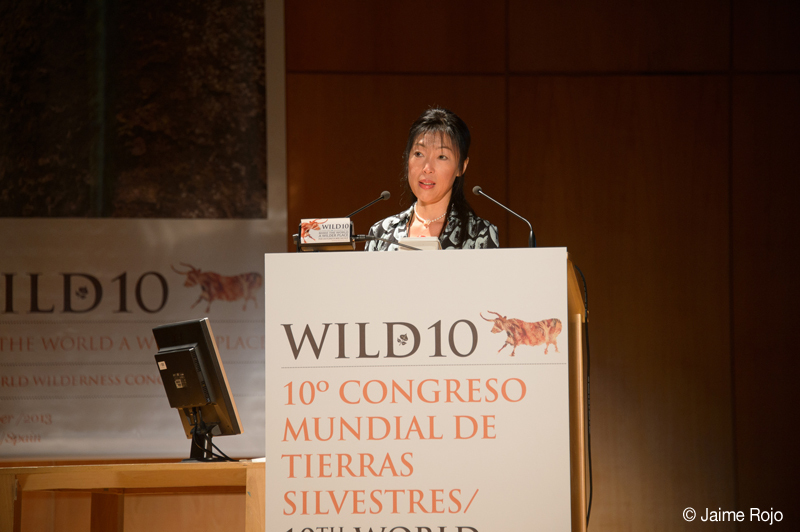 She feels very committed to the 10th World Wilderness Congress, since its founder, Dr Ian Player, has supported her since the early beginnings of the Save China’s Tiger project. “Now we have Rewilding Europe and other projects, so this is not controversial, but 13 years ago it was”, she explains. Regarding this, she claims there is no magical formula. “We just have to talk more to children. It’s all about talking. If we have more messages, more people will get involved”. WILD10 seems to be a perfect forum to start spreading these messages. Interview conducted by Elisa Hernández Sánchez – born and raised in Salamanca, Spain, Elisa is a translation and interpretation graduate, has a Masters in Secondary Education, and a Degree in Art History. On top of all this, she is interested in sustainable communication and cultural dissemination. An Avenue to Sustainable Transportation.